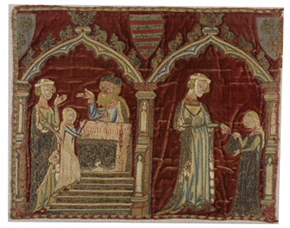 Nearness | Rift: Art and Time in the Textiles of Medieval Britain will gather a multidisciplinary group of scholars to address a range of historiographical and methodological problems implicit in the study of textiles, and to discuss new case studies from medieval Britain. 9:30 – 10:00 AM: Coffee. 10:00 – 10:15 AM: Introduction by Luke A. Fidler (Doctoral Student, Department of Art History, University of Chicago). Respondent: Tristan Sharp (Doctoral Student, Department of History, University of Chicago). 12:15 – 1:30 PM: Lunch. Respondent: Carly B. Boxer (Doctoral Student, Department of Art History, University of Chicago). Respondent: Karin Krause (Assistant Professor of Byzantine Theology and Visual Culture, University of Chicago). 3:15 – 3:30 PM: Coffee. Respondent: Julie Orlemanski (Assistant Professor of English Language and Literature, University of Chicago). 4:15 – 5:00 PM: Closing remarks by Aden Kumler (Associate Professor of Art History, University of Chicago) and final discussion. This entry was posted in Conference and tagged Bayeux Embroidery, Bayeux Tapestry, Dress, England, materiality, Opus Anglicanum, Textiles, Vestments on April 11, 2016 by Meg Bernstein. Meg Bernstein is a PhD candidate in Art History at UCLA. Her thesis examines the architecture of the English parish church in the twelfth and thirteenth centuries.